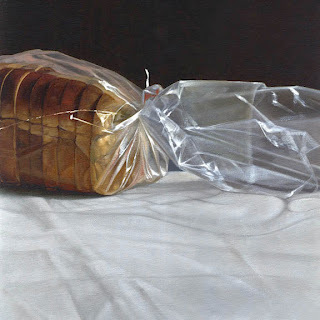 And finally the third ebay painting for this week, Sliced Bread No.2. This will be the final large painting on canvas to be listed on ebay for a while. The Chicago commission is getting closer to completion, and I plan to get back to multiple small paintings on hardboard for auction once it's done. I'll also have to get busy producing new work for the galleries. These commissions have taken me out of the loop for sometime, and I need to start concentrating on all of them. I must admit I'm going to miss this commission work. I'll post an image of the third completed commissioned painting tomorrow. 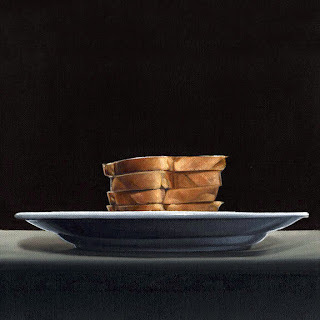 If you would like to bid on Sliced Bread, you can access the auction by clicking here. Here is the second of three larger paintings to be auctioned on ebay. It's 12 x 12 on gallery wrapped canvas. Tomorrow I'll post the final piece for auction. The third commission for Chicago is complete, but I'm going to wait until these auction paintings are all up before I post the image. The theme for this one is Family, and I'm really pleased with how it turned out. It's simpler that the previous two, but it has a good feel. I like it. If your interested in bidding on the painting above, you can participate in the auction by clicking here. The third commissioned piece is nearing completion, and I should have an image of that in the next couple of days. In the meantime, I've gotten back a few gallery paintings, and I've decided to auction them on ebay. Stacked Bread No. 2 will be the first. There will be three in total. Two paintings at 12 x 12, and one at 10 x 10. These will all be offered with a reserve price of $500 for the 10 inchers, and $700 for the 12's. If you'd like to bid on this first piece you can access the auction by clicking here. 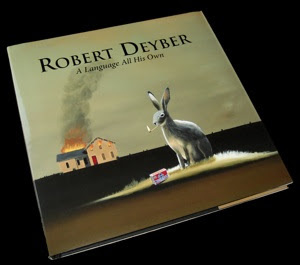 In other news, our friend Robert Deyber just announced the publication of his first hardbound book of select paintings. Production was handled through his gallery, Martin Lawrence, and it's titled, A Language All His Own. Our copy arrived a few days ago, and it's terrific. The book is layed out beautifully, and the reproductions are gorgeous. Karen and I are so happy to see our good friend doing so well. Congratulations Bob, "you're the man"! Our friends Jeff and Leslie Cohen have joined the blogoshpere. Welcome to the Monkey House was launched on March 14th, and will be a combined effort of the both of them. Thicket will be sent to Alan Avery Gallery for his April 17th show. Jeff and Leslie are two of the most entertaining, and talented people we know, and I'm sure this site will provide informative amusing prose, as well as their beautiful artwork. 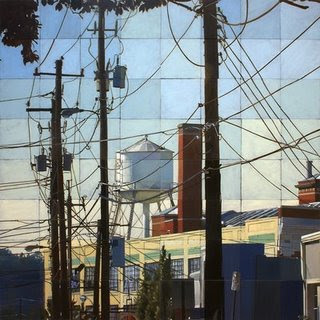 If you'd like to participate in the auction for Leslie's painting, Waiting for Burritos, you can bid by clicking here. One of the more unexpected moments of the last week began as Karen and I were in the waiting room of the doctors office. 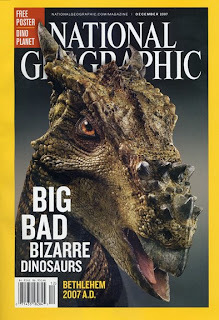 I was leafing through a magazine when I came across an article that included pictures of dinosaurs. I am a sucker for dinosaurs. So I'm reading the article about this new science museum that had just opened north of Atlanta, when it mentions the name of the executive director, Jose Santmaria. Jose and I went to high school together. He and I had kept in in touch up until the eighties, but eventually we lost contact with each other. When I read his name in the article, I couldn't wait to get home, and give him a call. It was great to hear his voice again, and we had a good conversation. Before we ended the call we made plans for Karen and I to come up, some time in the near future, visit the museum, and get reacquainted. The name of the facility is Tellus: Northwest Georgia Science Museum, and I can't wait. 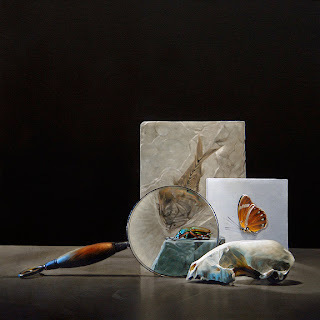 Continuing on with the paleontological theme, I received a very nice email from artist Darren Maurer a couple of weeks ago in refrence to the first of my Chicago commissions, titled Discovery. He was very complimentary of the work, and surprised to read that I had such an interest in science. As it turns out Darren is an amateur paleontologist. He is part of a group of four fossil hunters that spend all of their free time between April and October at one several dig sites in western South Dakota. His group was responsible for the discovery of the creature on the cover of the December 2007 issue of National Geographic magazine! That is so cool. Thanks Darren for the kind words about my painting. Good luck this season. Here is the second completed Chicago commission. The theme of this painting was Learning. The first thing that came to mind as I mulled over this subject was wooden blocks. 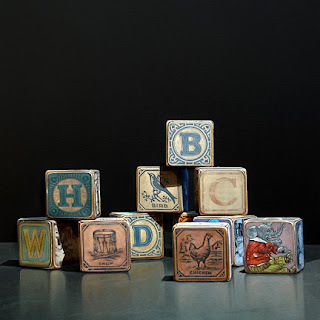 I spent a considerable amount of time on ebay searching for vintage wooden blocks, and discovered quite a few listings. Most of them were suitable, and reminiscent of the blocks from my childhood, but when I came across these I knew I had found exactly what I was looking for. They're hand crafted by a woman named Brenda, and sold under the banner My Fathers House 4. You can find these blocks, and other items she creates with that "vintage" look on her blog. Now it's on to number three. The subject of that will be Family. The second commissioned painting is getting very close to completion, so close in fact that I've decided to hold off, and wait until it's done to post it. It'll probably be up in the next few days. In the meantime, I thought I'd post some current event items. 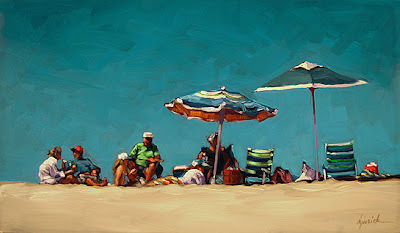 Leslie Levy Fine Art, Karen's gallery in Scottsdale Arizona, has chosen to market her prints. They've done a great job of presenting them on their website, and we're hoping this will prove to be a successful venture. Biased as I am, I have to say that the quality of these reproductions is exceptional. Gallery Street does an amazing job producing them. Karen is a fanatic about matching the prints to her originals, and these are, "spot on". In other news, Karen was doing an internet search yesterday for Liana Repass, an artist we both love, who also shows at Mason Murer Fine Art. 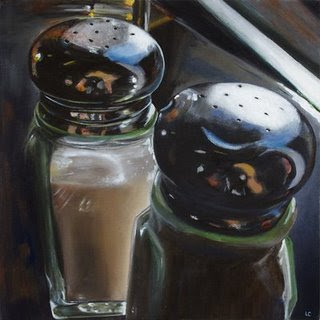 She does superb pastel paintings of water. In her search for more information about Liana, Karen came across the website of Deborah Dyste, an interior designer here in Atlanta. 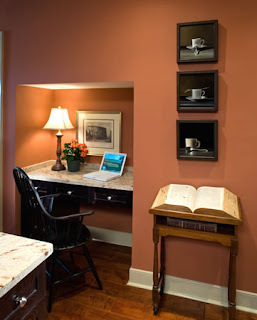 As she scrolled down the page she came across the image above, and thought the paintings looked familiar. Further scrutiny showed it to be a trio of my coffee cup paintings which had sold through Twinhouse, my now defunct Atlanta gallery. I don't know how newsworthy this is, but you so rarely get to see your sold paintings hung in their new homes. It was nice to have an opportunity to see how these had been displayed. 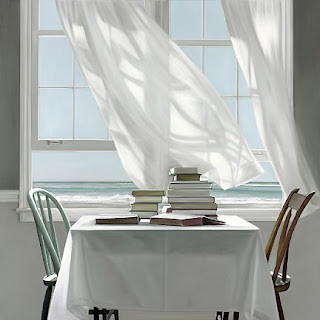 Our friend Karin Jurick is in Hilton Head SC this weekend to attend the reception of her one man show at the Morris & Whiteside Gallery. They recently aquired the Red Piano Art Gallery, and this will be the premiere opening following that aquisition. 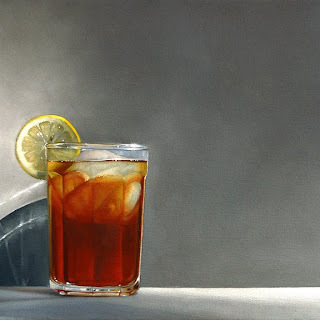 This is a very nice gallery with some heavy hitters in the art world. The roster includes artists like: Milt Kobayashi, Joseph Lorusso, Dean Mitchell and Stephen Scott Young. The work Karin has produced for the show is wonderful. I think some of her best work to date. Karen and I had been debating as to whether we would drive up for the reception. With all we both got going on right now, and having just returned from Florida ourselves, we opted to stay home, and work instead. I think it's going to be a great show. Can't wait to talk to her, and find out how it went. And lastly, I got myself a new computer this week. My trusted Power PC was over five years old, and starting to show its' age, so I convinced myself that I needed a new computer, and got one of the new 24" iMacs. I bought my first Apple computer in 1988, and have been a loyal owner ever since. 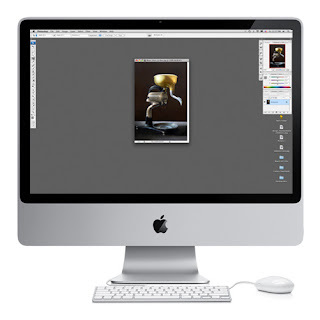 When I saw that the new iMacs had come out with a significant performance boost/price drop, I couldn't resist. I have to say, "it's glorious". I've spent the beter part of the last two days "playing" with it. This is another reason I couldn't take the time to make the journey to Hilton Head. So anyway, if you're in the market for a new computer, I highly recommend stopping by an Apple store, and checking out the new iMacs. It's a sweet machine. I finished the first painting for the Chicago commission yesterday, and I'm very happy with it. The company is dedicated to promoting childrens' health, and each of these four paintings is to represent a specific theme in the development of a child. The subject of this piece is "discovery". I developed this composition by re-visiting my own childhood. My brother Doug, and I were both fervent naturalists in our youth. My brother especially. Had he followed that route, I think he would have made an extraordinary scientist. I did "encourage" him somewhat. To this day he recounts the story of how I forced him into a closet, and refused to release him until he had named all of the geological epochs. In chronological order. Fossils, sea shells, rocks, fish, insects and reptiles were a big part of our young lives. So, when I pondered on how I would portray discovery, I concluded that my own childhood discovery of the natural world was what I wanted to represent. "Learning" is on the easel now. The evening before we left for Florida Karen, and I headed into town for the opening night reception of Karen's first show at her new Atlanta gallery Mason Murer Fine Art. It was a group show, with a large attendance. By all accounts, her work was very well received. We both had a great time. Met some new artists, and also got to spend some time with old friends. One of those friends Jeanie Tomanek emailed us this morning to alert us to this video created that night, and posted on the Mason Murer website. Karen's segment comes in near the end. I've completed the initial pass on the first painting for the Chicago commission, and being so close I decided to wait until it's finished to post an image. Hopefully, it will be ready in the next few days. I don't usually allow myself to appreciate my own work in progress, timid that it will jinx me, but I have to say, I really like how it's turning out.